Blood Money: John McCain Got $15,000 From Theranos Executives, Gushed About Disgraced CEO Elizabeth Holmes. Once the toast of the tech world and formerly valued at an estimated $9 billion, Theranos is now a byword for the industry’s “fake it till you make it” culture. With Theranos’s laboratories shuttered and its claims of revolutionary blood-analysis technology exposed as nothing more than hype, the U.S. Securities and Exchange Commission (SEC) dropped what might be the final bomb on March 14, charging Theranos, its charismatic founder and CEO Elizabeth Holmes, and its former president Ramesh “Sunny” Balwani with an “elaborate, years-long fraud,” during which the company raised $700 million from credulous investors.U.S. Sen. John McCain received thousands of dollars in contributions from executives at the Silicon Valley healthcare-technology company Theranos. In a symbiotic relationship reminiscent of his involvement in the Keating Five scandal of the late 1980s, the Arizona Republican played cheerleader for the venture online and supported a change in Arizona law to give the company unfettered access to the state’s consumers. Good to see @theranos Founder & CEO Elizabeth Holmes today - remarkable young innovator, glad she's doing biz in #AZ! Company execs also made false claims that Theranos technology was used on battlefields in Afghanistan and widely misrepresented the amount of revenue the company was generating, according to the commission. Holmes and Theranos agreed to settle the fraud charges without admitting or denying the SEC’s charges. Holmes has promised to pay a $500,000 fine and relinquish her majority voting shares in the company. McCain, who in 2015 served as a tireless booster for Holmes and Theranos, has been mum on the company’s ignominious slide. The senator is fighting an aggressive form of brain cancer and has not been back to Washington, D.C., since returning home to his Sedona ranch in December. His office did not immediately return phone calls and emails from Front Page Confidentialseeking comment. According to filings with the Federal Elections Commission, between October 2015 and June 2016, McCain’s re-election committee, the Friends of John McCain, accepted a total of $15,000 in campaign contributions from Theranos bigwigs, including general counsel Heather King, president and chief operating officer Ramesh “Sunny” Balwani, and vice president of communications Brooke Buchanan. Buchanan, McCain’s former press secretary, left Theranos in 2016 to become a top flack for the Whole Foods grocery chain, which has since been acquired by Amazon. 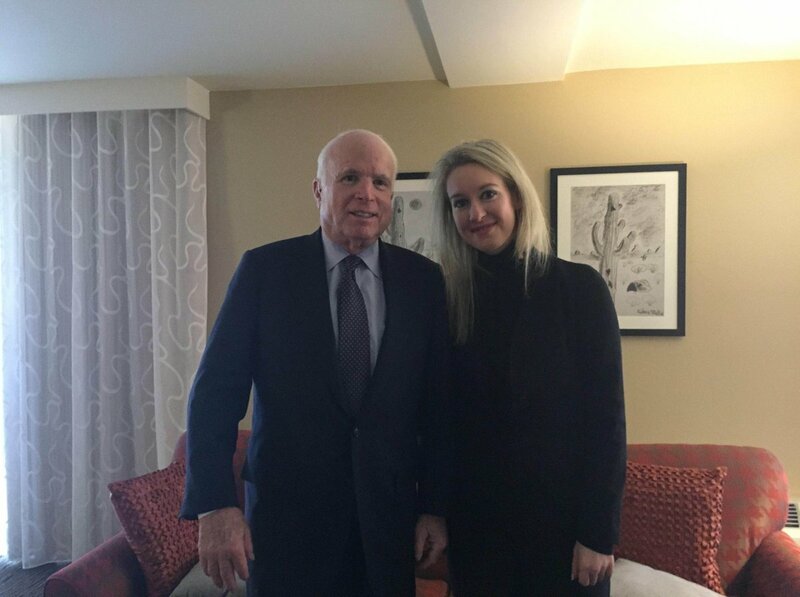 During much of 2015, McCain championed Theranos and Holmes on Twitter, praising Holmes as a “remarkable young innovator” and posting photos of the two together, sometimes deep in conversation. Holmes participated in that year’s Sedona Forum, the exclusive, invitation-only event sponsored by the McCain Institute for International Leadership, at which billionaires, generals, and foreign dignitaries gather annually to hobnob and discuss world affairs at the Enchantment Resort against the backdrop of the location’s stunning red rock formations. Despite his precarious health, McCain has some ‘splainin’ to do.